For many people, summertime is filled with cook outs, picnics, outdoor adventures and travel. With a little planning, you can make sure to have fun and take care of your health, too. Picnics and cookouts tend to work well for a gluten-free diet. Most grilled foods, like 100% beef or turkey burgers,skewers of shrimp (watch the marinade!) hot dogs, chicken breasts, etc. are gluten-free in the regular grocery store, so you can co ordinate with your host and ask about any marinades, or just bring your own food to grill. For vegetarians, grilled Portabella mushrooms, red peppers (my favorite) and veggie skewers work well. If your host is grilling buns, marinated meat, or anything else ‘glutenous’ in the same area, bring along aluminum foil to wrap your food and keep it safe from cross contamination. Just bring along your own bun, or in a pinch, use a lettuce leaf as a wrapper. It helps to carry a few little packets of condiments, in case there aren’t squeeze bottles of mayo or mustard. Green salads, fruit salads and watermelon are usually on the menu, and don’t forget grilled corn on the cob as a yummy treat! Quinoa salads are wonderful in this weather, and are getting more popular. Ice cream, popsicles and frozen fruit bars are usually gluten-free, though it’s important to check the label because there are exceptions, like Fudgesicles, that contain barley malt. Since these events are often potlucks, it’s easy to bring along a safe dish that you’ll enjoy. As for other summer gatherings, the general rules are to bring a dish you can safely eat and enjoy, bring clean utensils just for your dish, serve yourself first, scout out naturally gluten-free options (corn on the cob, watermelon, salad) but be on the look out for sources of cross-contamination. If all else fails, having a back up option like a gluten-free bar is a good idea. 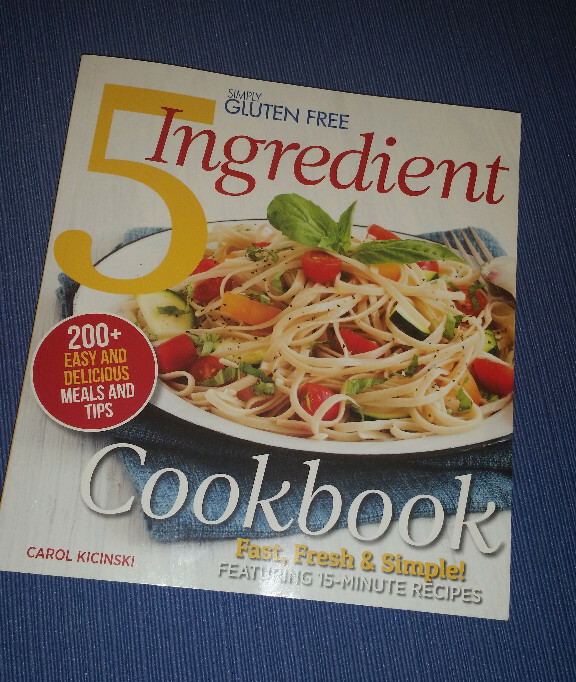 Carol of Simply…Gluten-Free put out a cookbook, Simply Gluten Free 5 Ingredient Cookbook: Fast, Fresh & Simple! 15-Minute Recipes. I’ve been having fun with it. First of all, the pictures are amazing, and there are pictures for every single recipe. Part of what I like is that all the recipes are pretty simple dishes that happen to be gluten-free and most are the kinds of things I like to make. Many are dairy/soy/grain/sugar free, and there aren’t a ton of gluten-free flours used. I’ve worked on the Simply Gluten-Free Magazine, Carol’s mag for years, so I know Carol’s work, and I was excited even before I got the cookbook! I have a review of three of the recipes and cookbook giveaway here. Medscape did a neat review on Celiac and gluten sensitivity and neurological dysfunction. You may need to set up a free account to read it. A new study showed changes in bacteria are common in people with Chronic Fatigue.Syndrome. The hope is that this may be a path to an eventual treatment, including food as a way to alter symptoms. Gluten-Free Watchdog has done testing on the gluten levels in probiotics. I can’t legally post the data here because there’s an effort to publish the data, but some common probiotics are higher than ideal and one was really high. If you’re interested to find out where yours fits, consider joining GFW.